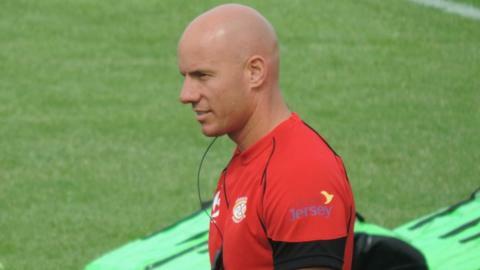 Jersey boss Harvey Biljon has said his side's showed the character of his players. Having been 22-5 down at one point the islanders pulled it back to 29-29 before Ryan Lamb kicked a last-minute penalty to win the game for Warriors. "It really showed the character of the players," Biljon told BBC Radio Jersey. "I know people talk about us coming away with two points, but I honestly believe we could have potentially got a bit more." The island's director of rugby added: "I'm really proud of the players." "Not only have they performed well but they've represented our rugby club and our island really well." The result keeps Jersey in sixth position in the Championship, five points off the final play-off place and 13 points clear of bottom-of-the-table Plymouth Albion. "The players have always got the belief that they can go out there and win a game, but the really impressive bit for me was the fact that we stuck to the task and continued to improve on our accuracy," Biljon added. "I'm proud of the improvements the players are making and I know the players will go away this week and want to work harder going into the British and Irish Cup. "Worcester are a quality outfit, so the fact that we've come away from home again and got points again means that we're making the improvements we've set out to."